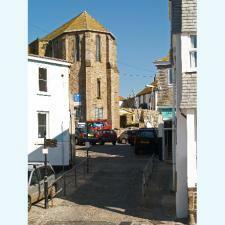 Situated in the crypt of the former Mariners Church, an imposing building in the heart of the old quarter of St Ives. In this prestigious location a stones throw from the picturesque and busy St Ives Harbour it is an ideal venue for individual artists or artist-groups to rent. January 3rd - February Cost £200 per week. A parking space is provided to those who rent the gallery and can be used for the duration of the exhibition.